From Konya to Istanbul, the dozens of pedalling stars participating in and the millions of fans turning their eyes to the 54th Presidential Cycling Tour of Turkey will enjoy some of the most spectacular, historic and touristic venues of the country along 935.9 kilometres. The event will start inland on October 9th, then head to the blue Mediterranean shores where riders will fight for the coveted turquoise jersey before a final stage in Istanbul on the 14th. These six stages will offer hard racing at the UCI World Tour level and showcase the iconic beauties of Turkey on a global scale with TV broadcasting around the World. 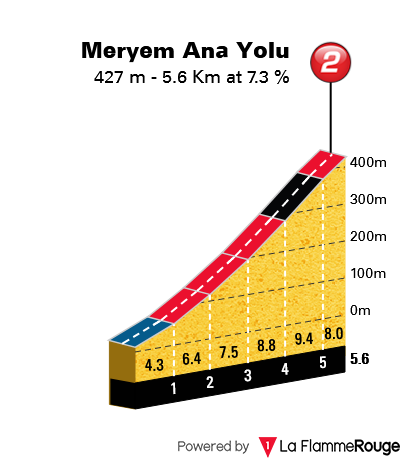 The first stage around Konya, home of the Mevlevi Order, will already feature lumpy roads en route to the finish at Alaeddin Hill, a tumulus where initial settlement dates back to 3000 BC and where champions will fight for the prizes of the 54th Presidential Cycling Tour of Turkey. The following stages, set on the Mediterranean coast from Alanya to Antalya and Fethiye to Marmaris, will offer breathtaking views on the Sea and iconic historic venues along the caravan routes. They should also offer good memories to Sam Bennett, on roads where he claimed success in 2017. Riders will then head to Selçuk, as they did last year, and they’re expected to produce a fierce battle next to Ephesus and the Temple of Artemis, one of the Seven Wonders of the Ancient World. In 2017, Diego Ulissi made the most of this summit finish en route to the overall victory in the Presidential Tour of Turkey. This day is anticipated as the queen stage. Stage 5 will head to Manisa and the Aegean region, favouring a bunch gallop before the iconic finish in Istanbul on Sunday. The final stage will see the riders above and under the sea, through the Osmangazi Bridge (the World’s fourth longest suspension bridge) and the Eurasia Tunnel (100 metres under the Bosphorus) before a final showdown close to the Blue Mosque, the symbol of the city with its six minarets. Diego Ulissi will face strong rivals but also enjoy strong support from his UAE Team Emirates as the Italian puncheur comes back to the Presidential Cycling Tour of Turkey after winning the race in 2017. Sam Bennett (Bora-Hansgrohe) wants to keep his own winning streak going but he will face an increased competition in the sprints with challengers such as Fernando Gaviria (Quick-Step Floors) and John Degenkolb (Trek-Segafredo). Nine teams from the highest ranks of cycling will line up in Konya to tackle the 54th Presidential Cycling Tour of Turkey on Tuesday. Ten Pro Continental teams as well as the Turkish National Team are also ready to participate in the prestigious UCI World Tour event over six stages leading to Istanbul. The defending champion Diego Ulissi will lead a strong UAE Team Emirates as he tries to retain his crown against strong rivals chasing glory on the Turkish blue shores. The Italian puncheur will notably enjoy the support of the Polish veteran Przemyslaw Niemiec, winner of a stage in Istanbul in the 2016 Presidential Cycling Tour of Turkey and 8th overall last year. Alexey Lutsenko will try to make the most of his all-rounder abilities at the helm of Astana Pro Team. The Kazakh star, who claimed two gold medals in the Asian Games, won the Tour of Oman in February and already proved he can also be a man of the end of the season. Nathan Haas (Team Katusha Alpecin) also shined in Oman and will display his punching abilities in Turkey while climbers like the young talent Mark Padun (Bahrain-Merida), coming from his top 5 performance at the Worlds, or the experienced Sergio Pardilla (Caja Rural-Seguros RGA) will try to make the most of mountainous terrains. Among Pro Continental Teams, the Colombians of Manzana Postobon will try to confirm at the higher level after a string of victories in China this summer. Winner of four stages in the 2017 Presidential Cycling Tour of Turkey, Sam Bennett (Bora-Hansgrohe) was the indisputable king of sprints last year. The Irishman, who also took three stages this year at the Giro d’Italia, will chase again the green jersey of the points classification but he will face an increased competition in the bunch gallops. With already 69 wins in 2018, Quick-Step Floors still want more and so does their sprinter Fernando Gaviria, a rider many label as the fastest man in the World after his two stage wins in his first participation in the Tour de France this summer. Gaviria is coming with the new Colombian sprinting sensation Alvaro Hodeg and veterans who already enjoyed success in Turkey, Maximiliano Richeze and Iljo Keisse. Edward Theuns is another stage winner in Turkey looking for more success this year. The Belgian rider from Trek - Segafredo comes this time with one of the most successful classic hunters of his generation as John Degenkolb will race the Presidential Cycling Tour of Turkey for the Xth time in his career. Since this is a road race, he doesn't get a full suspension. I mean bike! He doesn't get a full suspension ...bike!. according to the stage communique he got 10 seconds for "pushing the member of another team"
I couldn't really get excited enough to write anything about this one. The Istanbul finish delivered on the final day though, Bennett with a great late solo attack instead of a sprint, and Prades turned things around by coming 2nd, beating Lutsenko on countback.